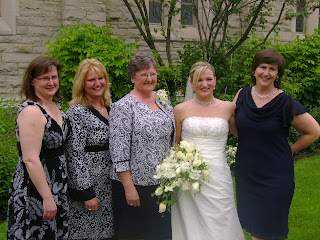 Isn't this a great photo of my cousins and aunt? Peggy is the beautiful bride. I like the photo too. We had so much fun. Hope you are having a good weekend. Wow - that really is a fantastic picture of the Reidy girls! I am so sorry that I was not able to make it - but I'm glad you did. It sounds like it was an absolutely beautiful wedding with two beautiful people. Hi Joanne - that is a good picture - and they are color co-ordinated! We were there, but I don't think we took any pictures - it's good someone does .... thanks.